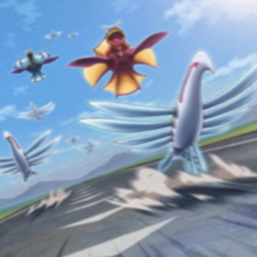 "Stormrider Griffore", "Stormrider Hippogriff" and several "Stormrider Skyfisher" in the artwork of "Stormrider Return". Stormrider is an archetype of WIND Cyberse monsters used by Windy in the Yu-Gi-Oh! VRAINS anime. This page was last edited on 5 March 2019, at 04:28.